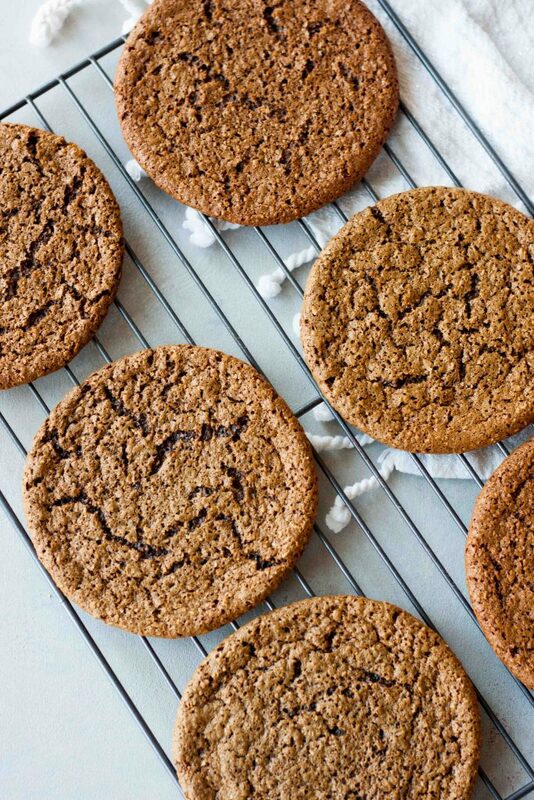 It has to be a good week when National Cookie Day falls on a Monday, we’re celebrating with jumbo Chewy Gingerbread Cookies! One of my favorite things to do for the holidays is bake cookies. There are so many kinds of cookies out there but the week after Thanksgiving I like to ease into things with gingerbread. I don’t know why but I always think of gingersnaps and gingerbread as the transitional cookie between the two holidays. The comforting warming spices fill the house and taste so good. Then of course sugar cookies and gingerbread men need to be baked for Christmas, sugar cookies with elaborate decorations being my favorite. There are always other goodies but I’ve been trying to focus on only a couple per year unless making them for something specific. 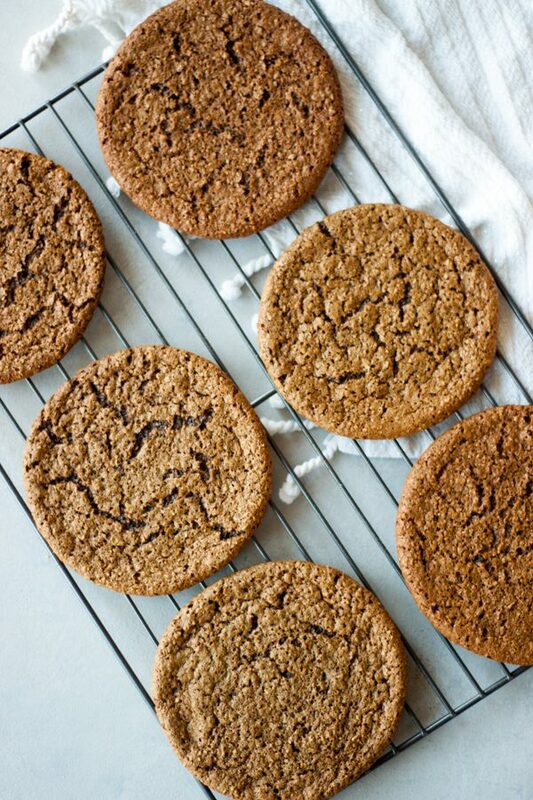 These Chewy Gingerbread Cookies are big cookies that aren’t just for Christmas and with minimal ingredients are easy to make anytime. Time has been really tight lately and I’m still able to squeeze these in. The funny thing about these cookies is that I make them with oats but my husband doesn’t consider them an oatmeal cookie and thinks the texture is like stoopwafels, sorry buddy no caramel filling in these. Of course that isn’t a bad idea and we might have to try making them into sandwiches with filling next time, maybe smaller cookies though as these jumbo cookies are really filling. You’re probably thinking I’m crazy right now, filling cookies?! Really thought you can eat just one of these cookies they are that filling. Not only because they are big (they aren’t that big) but because they are made with oats and almond butter. Add sugar, spices, and a little non dairy milk and you have cookies. So like I said simple and easy! They also just happen to be gluten free and vegan. Some days you just need a cookie and if today is one of those days just make one (no better reason then National Cookie Day) and brighten your Monday! 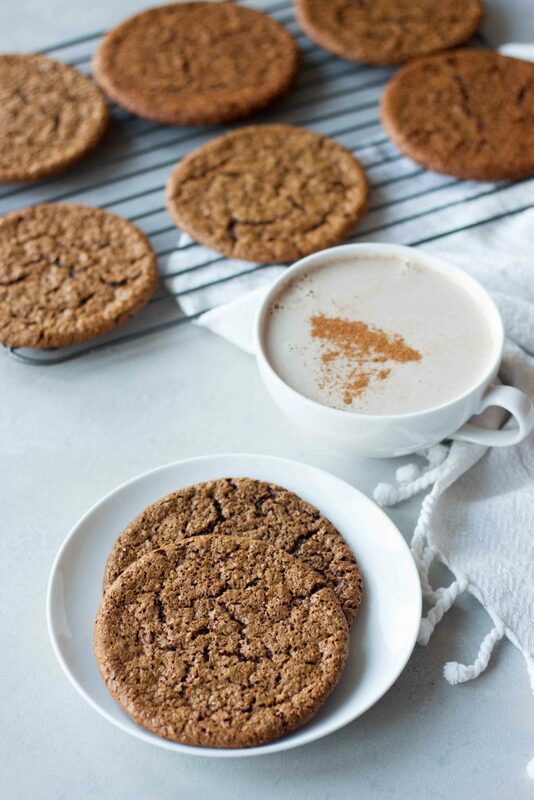 Chilly days there isn’t much cozier then snuggling up with a chai latte and one of these jumbo Chewy Gingerbread Cookies! The girls don’t have school today and I was hoping to make cookies with them but not sure we will be able to. It was a crazy weekend filled with soccer and dance. We went to cut down a tree on Saturday but were 20 minutes late to cut our own so we went and grabbed the girls a cut tree for the family room and were able to just squeeze in cutting one for the living room yesterday. We were up until after 10pm trying to get all of our decorations up but still didn’t and we’re all exhausted. If it snows like they say, the cookies will have to be made! The holidays are always busy and can be stressful and we are really trying to enjoy all the family moments and make time for what matters most. Lucky for me my girls like to bake cookies and help me in the kitchen and it’s one of our favorite holiday traditions. Are you baking cookies already? Do you have a favorite holiday cookie? 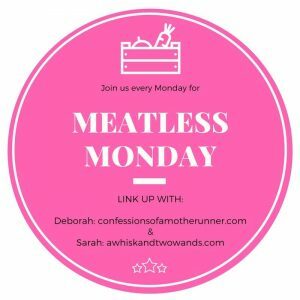 Today is not only National Cookie Day but it’s another Meatless Monday. My co-host Deborah and I look forward to seeing what’s cooking in your kitchen and inspiring others with delicious recipes. We’d love to have you join us and hope you enjoy the inspiring recipes linked up below. 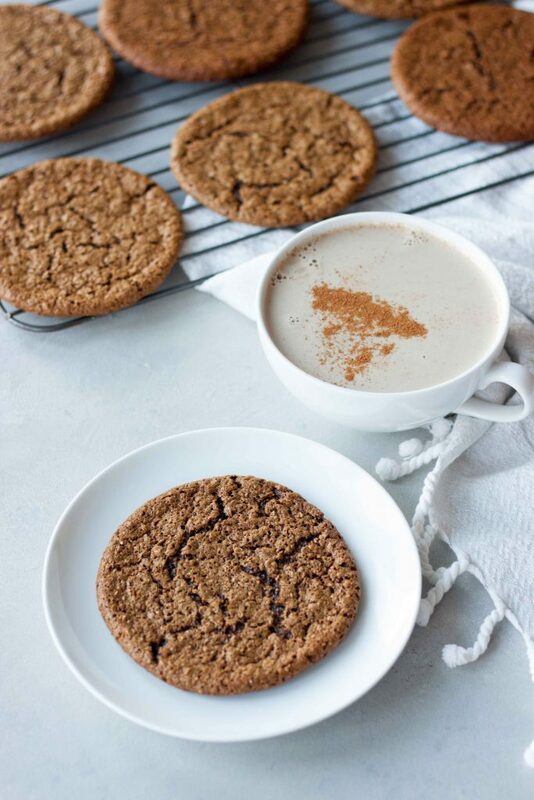 Delicious jumbo Chewy Gingerbread Cookies are simple and easy to make gluten free and vegan cookies that will add a little spice to your holiday or any day. Cream together almond butter, sugar, non dairy milk, and molasses with a hand mixer. In a separate bowl mix oat flour, baking soda, and spices. Mix wet and dry ingredients together, again I use a hand mixer. Refrigerate dough for 10-15 minutes, this will make it easier to handle and make nice round cookies. Line baking sheets with a Silpat mat or sheet of parchment paper. Using an ice cream scoop place spoonfuls of dough on lined baking sheet, leaving ample space as they will spread out, about 6 per baking sheet. Bake 11-13 minutes. They will appear soft in the middle but you don't want to overcook them. Let cool on baking sheet for 5-7 minutes before removing them to cool on a baking rack. *Grind oats into flour using a food processor or Vitamix. **Can sub brown sugar for coconut palm sugar if you preferred or you don't have it. ooh I love gingerbread cookies! These look easy and tasty. Hope you have a great Monday! Me too, might have to make more today since it snowed and it’ National Comfort Food Day.